Posted by Marquis Chapman in Sports, Top Five. If you walk into my dorm room, you can always count on two things: My room is always going to be a mess and ESPN will always be on my television. I don’t know what I would do without the worldwide leader in sports, and there are programs that I never miss. Here my Top Five ESPN programs. 5. Pardon the Interruption:PTI is a great show with a great concept. They don’t ramble on the latest news and headlines. They keep a set time limit for the argument and get straight to the point. Michael Wilbon and Tony Kornhieser are two of the best hosts working for ESPN. Although the show is laid back with constant jokes being thrown around, both Wilbon and Kornheiser make great points regarding sports and athletes. 4. First Take- As much as I like this show, I liked it better when they had Woody Paige going against Skip Bayless. Woody was kind of crazy, and Skip was a no nonsense type of guy, although he has loosened up these days. Still, the show provides heated debates between Skip and whoever dares to take him on. Overall, it’s a great show, but no one can ever replace Woody. 3. Mike and Mike in the Morning- I usually catch this show when I’m cramming for a test. It comes on at 3:00 am on the west-coast. What makes them different truly does make them great. With this show you get a fan point of view and a former player point of view. Mike Greenberg is an announcer that really knows his sports, while Mike Golic refrains from giving the typical opinions that we often get from former players. 2. Jim Rome is Burning- I’ve always been a fan of Jim Rome. Although he’s not as harsh as he was in past years, and no longer having athletes attack him, Rome definitely doesn’t hold anything back. When athletes and coaches do dumb things, Rome lets them have it in the segment called Rome is Burning. Another segment I like is The Forum where Rome discusses the latest sports headlines with two other sports journalists. What makes this show so great is the fact that Rome is often saying things that we sports fans wish we could say. 1.SportsCenter-C’mon, you knew this was going to be #1. What would the sporting world do without that familiar sound of duh-duh-da-duh-duh-da? SportsCenter gives sports fans everything and anything they need. Their commercials are classics and their commenators have fun. From highlights to interviews, this is the program to turn to. The show is virtually flawless. The only thing I would change is the Top 10 Plays. There have been too many times where a basketball highlight gets robbed by a hockey or baseball highlight for the top play of the night. Posted by Marquis Chapman in Football, NFL, Sports, Top Five. With Terrell Owens recently being fined $7500 for his touchdown celebration that mimicked the Patriots spying controversy, it would only be right to have this edition of Top Five ranking the many touchdown celebrations of T.O. 5. T.O. Takes a Nap: In a game against the Washington Redskins, T.O. pretended to take a nap in the endzone, using the football as a pillow. The entire week heading into the game, the media had criticized Owens for the reports of him falling alseep in team meetings. This was a very creative celebration to shut up the critics, and didn’t result in a fine. 4. T.O. Pays Homage to Ray Lewis: Facing the Baltimore Ravens, T.O. caught a short pass from Donovan McNabb and ran it in for a touchdown. Owens then proceeded to mimic Ray Lewis’ ritual pregame dance, and did a pretty good job at it. As you might expect, this made Lewis and the Ravens a little upset. Former Cornerback Deion Sanders came to Owens aid stating, “If you don’t want to see him dance, don’t let him score. Thats it.” Click here to watch the video. 3. T.O. the Cheerleader: In a game against the Green Bay Packers, T.O. gets a touchdown and quickly snatches the pompoms of a San Francisco 49ers cheerleader. Owens proceeds to do a quick cheer and drops the pompoms on ground. This was a very creative touchdown celebration and didn’t result in a fine, but he could have at least handed the pompoms back to the cheerleader. 2. T.O. Gives a Fan an Autograph: On a Monday Night Football Game against the Seattle Seahawks, Owens just couldn’t wait to give a lucky fan his autograph, so he stuffed a sharpie in his sock and went on the field. After scoring the touchdown, Owens pulls the hidden sharpie out of his sock and signs the football, handing it to a lucky fan in the stands. The “lucky fan” was actually Owens’ financial advisor. This particular touchdown celebration had people within the NFL, as well as many fans extremly upset and appauled. 1. T.O. the Star: The 49ers were in Dallas facing America’s team. T.O. was having a great game against the Cowboys. After each of the two touchdowns he scored, Owens ran to the middle of the field, standing dead center in the Dallas Star and raised his hands triumphantly. The second time Owens did it, players of the Dallas Cowboys took offense to his actions. Safety George Teague leveled Owens and a small altercation between some players from both teams ensued. Owens was fined $24,000 and was suspended for a week. Click here to see Teague level T.O. Posted by Marquis Chapman in Basketball, NBA, Sports, Top Five. 5. Clyde Drexler/Cliff Robinson- The Bulls and the Trailblazers met in the 1992 NBA finals. Jordan was after his second ring and determined to prove that he was better than Clyde Drexler. Although Drexler and Cliff Robinson would attempt to contain Jordan, MJ went off in the first game. Jordan got in the zone and made 3 pointer after 3 pointer, eventually hitting 6 threes in the first half. Jordan was so hot, he couldn’t even believe it. After he hit yet another three, he looked over at commentators Marv Albert and Magic Johnson, shaking his head and shrugging his shoulders as if to say, “I don’t even know whats going on.” In the first half alone, Jordan had 35 five points. The Bulls went on to win the game, and eventually their second championship. 4. The Boston Celtics- You know you’ve victimized a team when Larry Bird later refers to you as “God disguised as Michael Jordan.” Just a couple games back from a foot injury, Jordan abused the entire Celtics team, scoring 63 points at the Boston Garden. MJ really seemed unstoppable in this game. He was scoring at will and talking trash to the fans at the same time. Jordan abused Bird a couple of times down the court as well. Everyone remembers the move where he drove hard to the right, stopped and dribbled twice between his legs, and shot the jumper in Bird’s face. Bird looked lost on that play. No one had ever seen one player single handly destroy the great Boston Celtics. 3. Bryon Russell- No one wants to be remembered as the guy that Jordan hit the game winner over to win the series and presumably end his perfect career. Enter Bryon Russell. Although it may have been just a little push off, the game wining shot by Jordan in the 1998 finals against the Utah Jazz is an absolute classic. Russell was in a good defensive stance at the top of the key. Jordan drives hard to his right, gives Russell a “little nudge”, and shoots the J with perfect form. Nothing but net. Jordan then proceeds to hold his perfect form just a little longer than usual. The Bulls win. Russell is yet another player made famous by His Airness. 5. Tracy McGrady & Vince Carter- These two players could have done great things in Toronto. As far as chemistry goes, it couldn’t have gotten any better, due to the fact that they were cousins. Many people thought that they could have been a Jordan-Scottie type duo. Vince was the high flyer and McGrady was the big man that could handle the ball like a point. Fans never got to see the final product however, as McGrady eventually left for Orlando and would become one of the elite players in the NBA, overshadowing his cousin Vince. 4. 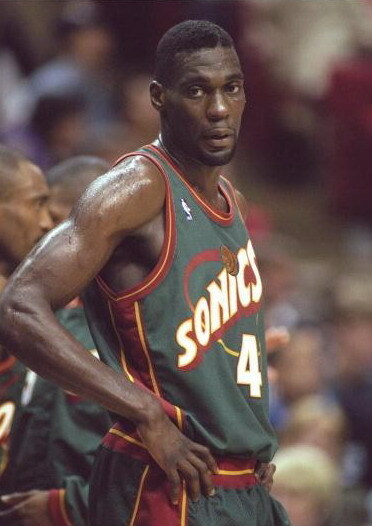 Shawn Kemp & Gary Payton- This duo was probably the most exciting to watch and had amazing chemistry on the floor. Shawn Kemp was the high flyer that posterized defenders nightly and Payton was the loud mouth point guard that played lock down defense. Payton seemed to know where Kemp was at all times and would throw alley oop passes from half court and off the back board for Kemp. They made it to the NBA finals in 1996 only to be defeated by the Bulls. Kemp went on to have problems with drugs and his weight, later playing with the Cleveland Caviliers for a couple of seasons. Payton continued to play for Seattle, but would never again reach the finals as a Sonic. Posted by Marquis Chapman in Baseball, Basketball, Boxing, Football, MLB, NBA, NFL, Sports, Top Five, UFC. 5. Charles Barkley- Oh sure, you may think that Charles Barkley is just your average NBA analyst with an opinion on everything, but back in his heyday, Barkley was one of the meanest players in the NBA. Standing 6’4” and weighing 252 pounds, players rarely got in his way when he came through the lane. Sir Charles has also been known to get into scuffles on and off the court. Barkley once threw a man out of a plate glass window during a bar fight, and is the only man in NBA history to actually pick up Shaq and slam him down. 4. Albert Belle- By far the meanest, most intimidating player ever to put on a MLB uniform, Albert Belle was not to be messed with. Standing 6’2” and weighing 225, he defiantely intimidated pitchers when he stepped to the plate. Some of his most famous incidents include throwing a baseball and striking a fan who was heckling him, chasing after a fan in the stands after the fan shouted a racist remark, and chasing vandals during Halloween in his car after they threw eggs at his house. 3. Ray Lewis- Don’t let the photo fool you, Ray Lewis is the most feared man in the National Football League. Running Backs choose to run out of bounds when Lewis is near and Wide Recievers dare not go through the middle when he’s playing the pass in zone coverage. Regarded as one of the hardest hitters in the NFL, offensive players are constantly aware where Lewis is at all times. His intensity can not be matched by any other player in the league. Standing 6’1” and weighing 250 pounds, Lewis always makes his presence known.